Cloudy and cool, Water temperature 64* and Clear. I got out early to catch bait then picked up the guys at High Point. 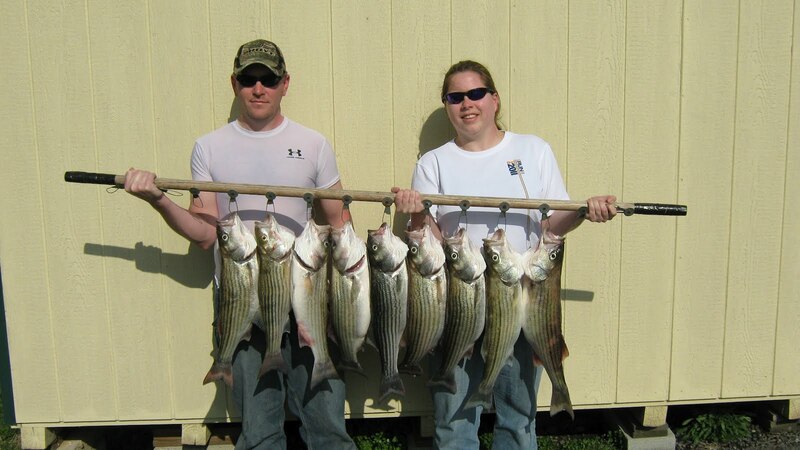 We set out a spread of planner boards and a bobber and before we knew it we were hooking up. Fish were feeding early this morning and it was all I could do to keep up with the action. Fish fed for about an hour before they shut off or us loosing a couple fish turned them off. We had gone through most of the bait so I had to go catch more which was not easy, I spent every bit of 2 hours till I caught 20 in one cast. I set out another spread with fresh bait and hadn't gone far before we started taking hits again. We fished in this area for the next 3 hours till we ran out of baits, not bad action for mid day fishing. 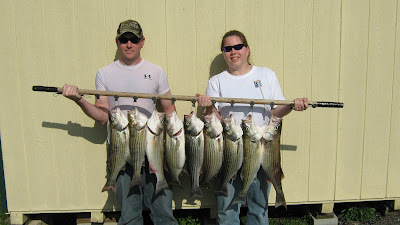 Today we kept 13 Stripers. Sunny and Pleasant, Water Temperature 61* and Clear. I got out early to catch bait this morning, picked the guys up and was fishing by 6:15. It was quite foggy this morning so I set up in an area where I thought boats would not run over us. We pulled a spread of a dozen planner boards along with a bobber and a free line over shallow points and flats. I was concerned about the water temperature dropping over the last couple days and also today was a poor day to fish according to the solunar tables. Our first hit was a catfish which confirmed my fears but the next half dozen hookups were traded off between Catfish and Stripers. We fished for about 4 hours going through about 30 baits before it was time to go catch more bait. I looked and threw for a couple hours before getting enough bait to set up a spread again. We set up over a little deeper flats this time and took 6 hits, boating a couple fish and loosing some very large fish. Overall it was a good day, the weather was beautiful with not too much wind, fishing was fair and friendship was great. Cloudy and Rain, Water Temperature 65* and clear. Picked the guys up at 5:15 and went to catch bait. I threw for about 45 minutes and caught 58 nice baits. I was excited about the morning, it was suppose to rain which hopefully keep a lot of the boaters off the water but when I called Doug yesterday his wife said he was out fishing and had fished the day before also, my kind of guy. 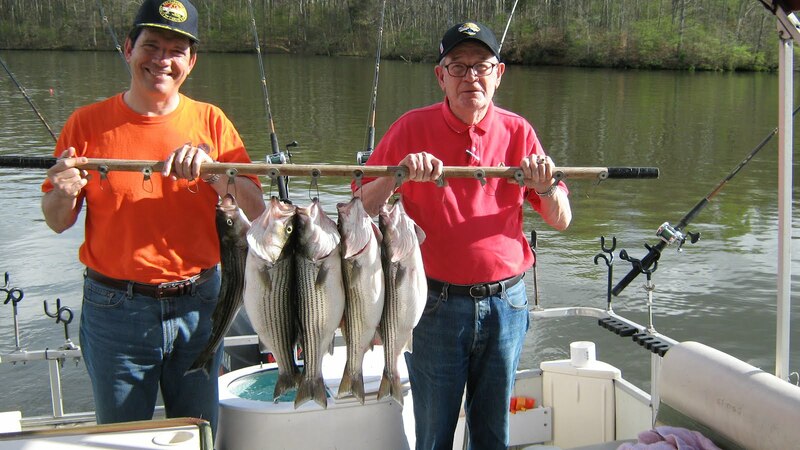 Doug and his cousin Joe were interested in seeing what this lake Striper fishing was all about and by the end of the trip I believe they found out. We had taken 46 hits when I ran out of bait in the tank so I emptied the tank and right before we started to get the remaining few baits in 2 hooked up at once and they reeled them in. Forty eight hits in a morning is quite a bit of action, makes you not even feel the rain pouring down on you. Brad got in touch with me about a week ago to fish today and take his daughter Casey out on the lake but I was previously booked so I hooked him up with Tony. Before Tony had deployed all the baits they started taking hits. 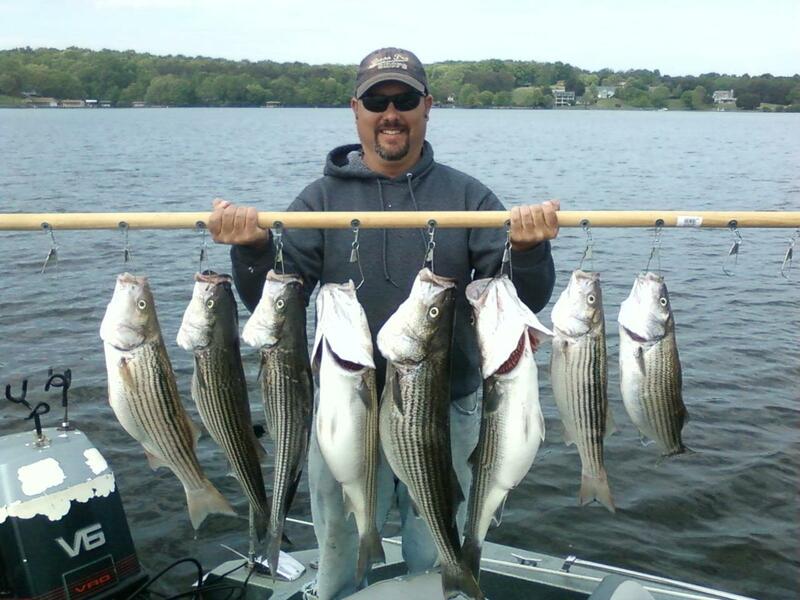 Tony had got on the water at 4 to catch bait to insure they could be fishing at daylight and it payed off with a nice stringer of Stripers. Today they had about 20 hookups, caught 9 Stripers, a nice Bass and a Catfish. The wind blew most of the day restricting Tony from fishing where he wanted to. Sunny and Windy, Water Temperature 58* and Clear. I picked the guys up at High Point at 5:30 this morning hoping to catch bait before daylight. The bait gods were with us today and we caught over 50 in about 5 or 6 throws. That enabled us to get a spread of baits out on the water at the crack of dawn early enough to beat some of the wind that has been blowing every day. I hadn't quite got all my boards out when the first Striper of the morning boiled a bait then hooked up for a brief moment. We got that rod in to change the bait and the one right next to it hookup up but 10 seconds later simply got off. Not a good start but at least we were getting hits. Instead of turning and going back I decided to just hold my course and put out my full spread. Lately it has not mattered where you fish, the most important factor to catching fish has been to stay away from boat traffic and keep out of the wind in order to keep your baits in the water column where the fish are holding. We caught 5 or 6 Stripers then the wind started howling again so I headed for a more protected area out of the gusting wind. Once I hit a calmer area and slowed the trolling motor down one of our free lines hooked up and Craig jumped on the rod. Next thing I knew the fish had pulled my tight drag out about 50 yards from where she originally hit. I cleared the back of the boat of rods that were out in order for Craig to fight the fish but it was too late, the fish had already got into one of our planner boards. Craig wrestled the fish from one side of our spread to the other, up under our boat to pulling out 30 to 40 more yards of drag. Craig's arms were on fire and he was ready to tap out but I got on him to keep doing exactly what he was doing, holding his rod high in the air, keeping the rod bent and not letting the line touch anything. Eventually the fish tired and Craig got the fish close enough to the boat for me to get a net under it. Craig was exhausted, the fish was HUGE and his father got it all on a video camera. We popped a couple of pictures and continued to try to fish the bank we were on. 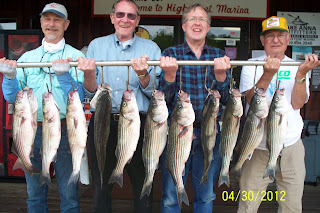 We caught a few more Stripers but the wind was getting worse and the 8 pounders they were reeling in just didn't seem to be much of a challenge any more. 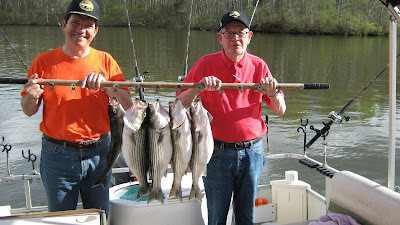 It was around 10 o'clock, Craig could not keep any more Stripers because he did not have much room in his freezer for fillets, they had conquered Lake Anna and were ready to go in and get the fish to a taxidermist. We went back to the marina and the fish pegged Carlos's scale. The fish was in excess of 21 pounds, a memory Craig and his Dad will never forget. Partly cloudy and windy, Water Temperature 62* and clear. Today was a slow day on the water, we fished all day for about a dozen hits. We ended up catching only 6 Stripers, a Bass and a couple Catfish. Hopefully after the full moon faze the fishing will get better. Sunny and Cold Front, Water Temperature 63* and Clear. We got out at 6 and went to catch bait. The wind was Howling and a storm had just blown through. We caught 38 baits then I looked for awhile for a place where I could fish where I could somewhat control the boat and my baits. 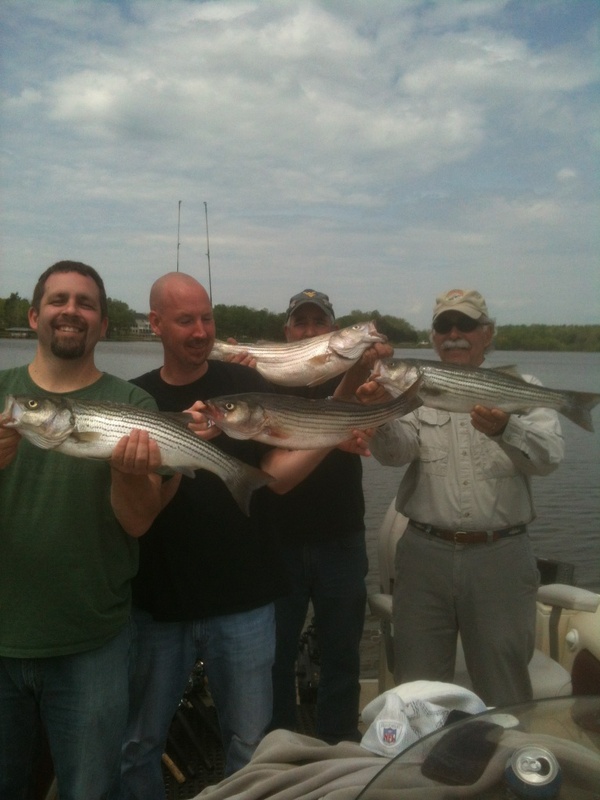 I had only gotten 3 lines wet when Jacob hooked up with the first Striper of the day. While he was trying to get it off the hook another Striper hooked up but got off before getting to the boat. Unfortunately where we took hits the lake was white capping so all I could do was try to keep the boat heading straight while I put baits out. We worked the area for about 2 hours boating 4 Stripers. Eventually we ran out of bait and had to catch some more. 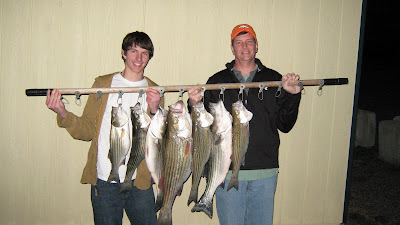 Fishing was SLOW but we hung in there and Jacob ending up having a ball catching Stripers. Today was an extremely slow day but Jacobs patience and fishing ability paid off with a nice stringer of fish. These are a few recent catches of Anthony"s clients.